As in the case of Freeview, this service is what it says on the tin – satellite at no charge which does not require a contract in order to be able to view. This equipment is very useful for people who want digital TV channels in areas where the aerial signal is poor, such as caravan parks, valleys or screened areas. It will also work for older TVs if required. Like Freeview, there is also Freesat PVR, which is similar to Sky+ and allows you record one channel while viewing another. 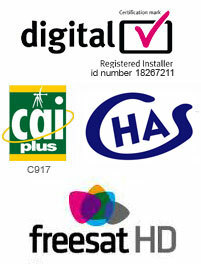 Freesat is also available in HD, providing your television is HD. We can supply all of the equipment or fit equipment that you have purchased yourself.